Admittedly, I’ve never seen A Beautiful Mind, although I’ve come across the clip parodied in the cartoon above which, as the New York Times also points out, is not a great example of John Nash’s contributions to game theory. But I’ve always liked the way game theory, like other forms of modeling, builds upward from simple premises, and Nash’s work features in a good chunk of what is familiar to me in game theory. So, in tribute to Professor Nash (and wishing to learn a little more about game theory), I’ve put together a little tutorial on building games into an agent-based model. Game theory considers how strategic decisions are made; these are usually conceived of in terms of the relative payoffs for each choice within a realm of possible choices for a given decision. Many of the games studied by game theoreticians are models and have a limited number of options, but depending on how the payoffs are structured and what knowledge is attributed to the players, these elementary games may produce non-intuitive outcomes and insights into behavior. This description is perhaps better served by an example: imagine you find yourself in the produce section at the grocery store, and you have to choose between buying a delicious pumpkin that requires two people to carry and buying asparagus that are less enjoyable. If you and an acquaintance work together, you can bring the pumpkin to the register and both benefit from eating it. On the other hand, both of you could just buy asparagus separately and get less enjoyment. But there’s also another option: one of you could decide to buy the gigantic pumpkin, while the other could take asparagus. This would leave one person with a decent amount of asparagus and the other without any pumpkin because they are unable to carry it. 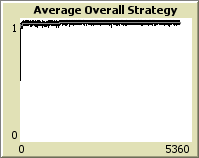 How does one decide which strategy to choose? 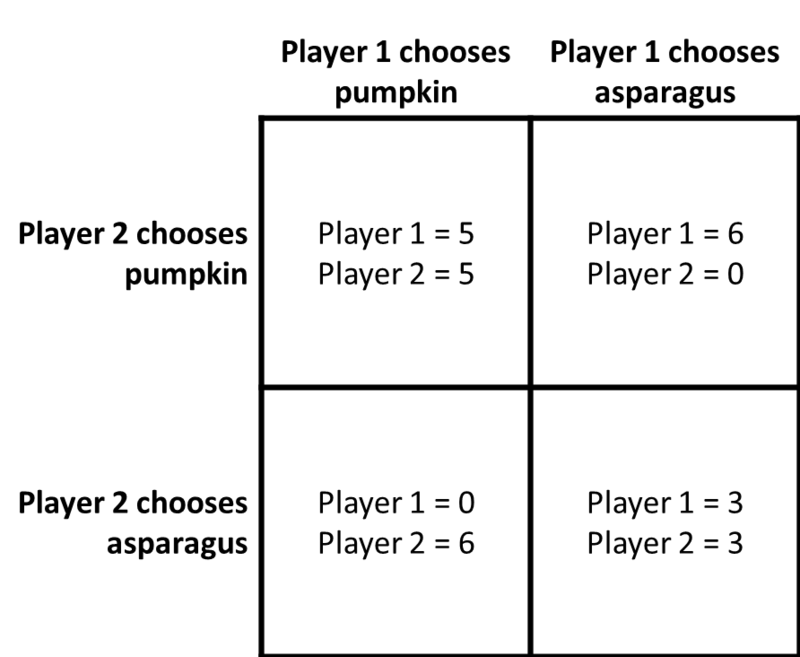 In this case, there is no rational reason for a player to switch strategies knowing what the other has chosen, so the game has two Nash equilibria: both players choosing the pumpkin, or both choosing the asparagus. Both of these games are kinds of non-cooperative games, which are a class of games in which the players make decisions without consulting one another (and the type where Nash made his most well-known contributions). Games explored by game theorists are usually conceptual, such that players are not typically constrained by any physical distance between them. Agent-based models, on the other hand, have the ability to incorporate space explicitly within the framework of the model, making it possible to inhibit or enhance agent interactions based on proximity. While the incorporation of space is not necessary for all models or games, many real world processes and entities are affected by space, so it might be useful (and dare I say fun?) to see how space might affect the outcomes of games. 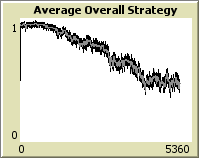 In that spirit, we’ll use NetLogo to build non-cooperative games within a spatial framework. In this model, agents perform a random walk, selecting a direction at random and taking one step forward. Following each step, agents search for other agents within a given radius, search-radius. 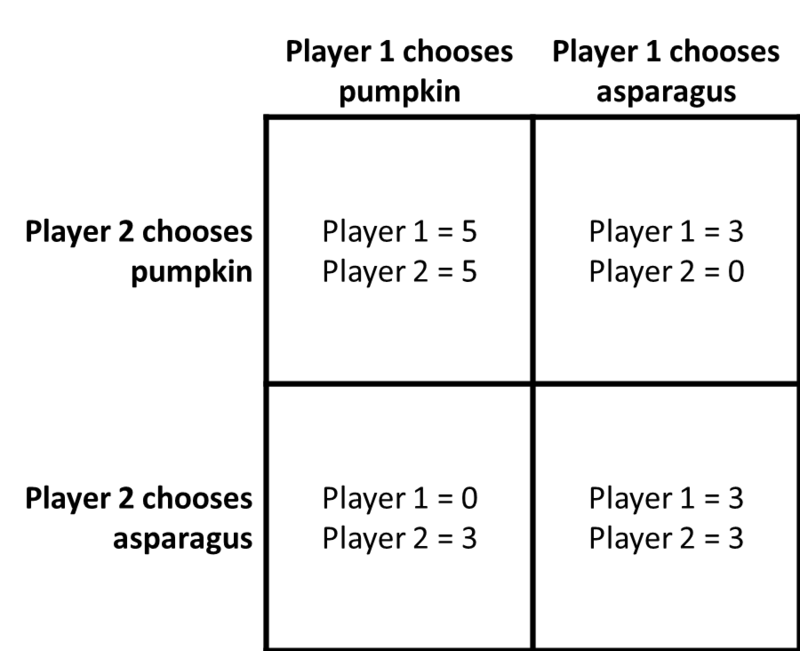 If any agents are present, one of them is chosen, and together they play a coordination game not unlike our produce aisle example above, receiving different payoffs depending on whether they choose to cooperate or defect. The model will be flexible enough so that the payoffs for both cooperating, both defecting, or losing and winning from a cooperate-defect scenario can be variables capable of being tuned by the user. We’ll call these, respectively, cooperate-cooperate, defect-defect, lone-cooperator, and lone-defector. These will be made into sliders at the front end of the model. Before we do anything, we’ll want to figure out how we want agents to make decisions. We could assume that agents know the equilibrium strategies and will thus act accordingly. But what if our agents don’t know what the payoffs will be? In the absence of any information, agents could make their decisions randomly, but this isn’t likely to remain a reasonable course of action once the agent has played the game a few times (this concept probably has a name, but for now we’ll call it the “this ain’t my first rodeo” effect). An alternative is to let agents make decisions about whether to cooperate or not based on their past experiences with other agents. We can do this by asking each agent to keep track of the payoffs in a set of lists for each strategy. 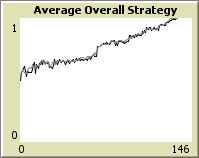 The relative numbers of choices of strategy in each time step can then be used to gauge how the population is making decisions. Here, the cooperate-history and defect-history variables will be lists used to keep track of payoffs received when a particular strategy is employed. For example, if two agents cooperate and the cooperate-cooperate payoff is 5, then both agents will add 5 to their cooperate-history lists; however, if one agent defects and the other cooperates, and the lone-defector payoff is 6 and the lone-cooperator payoff is 0, then the defecting agent will add 6 to their defect-history and the cooperating agent will add 0 to their cooperate-history. 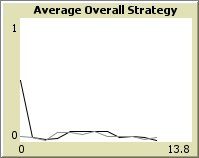 The decisions variable will keep track of all agent strategy decisions for each time step, with 1 representing a cooperation and 0 representing a defection. We can use this as a gauge on population-level decision-making as the model progresses. Now we can create the agents. What we need to consider carefully is how agents will make their initial decisions. We could start them out with no history whatsoever, and let them guess at first until they figure out a good strategy, but unless agents try both strategies at least once, they will unwittingly choose a random strategy and then stick with that strategy simply because the outcome of the other strategy is unknown. To get around this, we’ll seed the cooperate-history and defect-history of each agent with ten random outcomes from each of those choices. Here, we’ve taken the decisions variable and seeded it with an equal number of 0s and 1s, starting off with a mean value of 0.5; we do this so that the plot we create for this later has some values to use when the model is set up. Next, we create (crt) 100 agents, distribute them to random coordinates with the setxy command, and then give them cooperate-history and defect-history lists with randomly chosen outcomes for cooperation (either lone-cooperator or cooperate-cooperate) and defection (either lone-defector or defect-defect) respectively. In this code, the decisions variable, which is a list, is cleared in order to get fresh decisions from the new time step. This is done by converting it to an empty list . Next, each turtle is asked first to pick a random direction by using set heading random 360, and then asked to move forward (fd) one step. The agent then looks for other players. The any? command checks to see whether any of a specified group of agents meets a given criteria; in this case, we want to know whether there are any agents within the search-radius. If there are, we’ll run a routine called check-game. The check-game routine has three objectives: first, it determines what the preferred choice of our focal agent is based on their cooperate-history and defect-history lists; second, it identifies the second agent playing the game and determines their preferred choice; and finally, it determines the payoffs for both agents based on the combination of their decisions. This routine is a bit long, so we’ll break it up based into a few parts, using ellipses (…) to indicate where code leaves off and picks up. This code first declares a local variable for the choice of the focal agent (hereafter referred to as Player 1), called p1choice, and sets it to a default of 0 (defect). Then, it runs through a series of checks to see whether the p. First, it uses the ifelse command to check whether the mean value of the cooperate-history is greater then that of the defect-history, indicating this agent has historically received greater benefit from cooperating than defecting. If this is the case, it sets p1choice to 1 (cooperate). If this is not the case, then the agent uses if to check whether the mean cooperate-history is equal to the mean defect-history. If this is true, then the agent randomly sets its p1choice to one-of two values (0 or 1); otherwise, the agent retains its original p1choice of 0. Here, we set a local variable called p2 which holds the identity of Player 2, and associates that variable with an agent selected randomly from within the search-radius. We do this because the call of check-game is being made by a particular agent, and so any commands made to Player 2 are made through Player 1. So while the choice algorithm is effectively the same as that used for Player 1, variables held by Player 2 are referred to using the of command (for example, [ cooperation-history ] of p2). Now that this is done, we can compare the two decisions and establish the payoffs to each player. We’ll begin with scenarios where Player 1 chooses to cooperate. 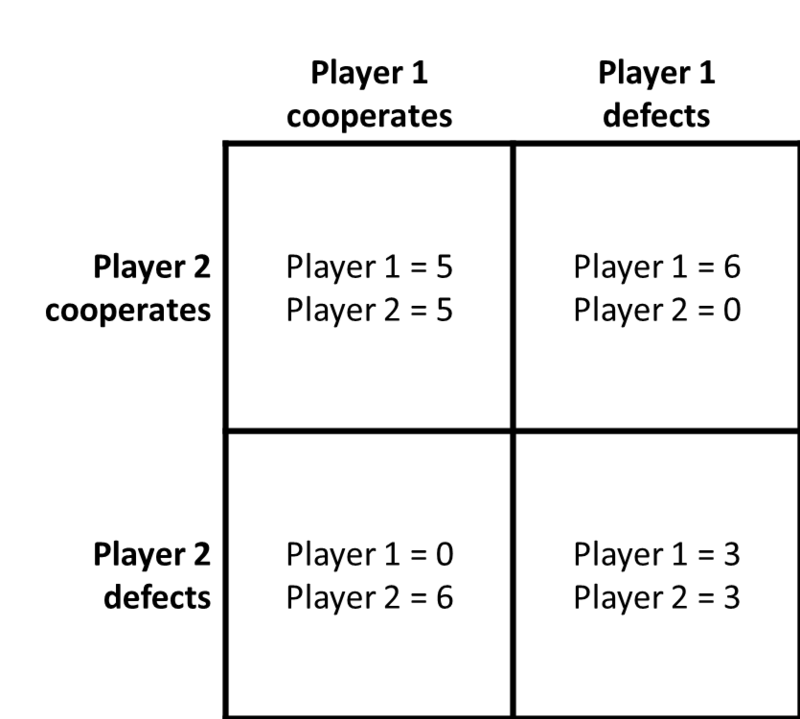 The first ifelse here is used to establish if Player 1 has chosen to cooperate or to defect, with cooperate being p1choice = 1. We use a second ifelse to establish if Player 2 has chosen to cooperate or to defect. 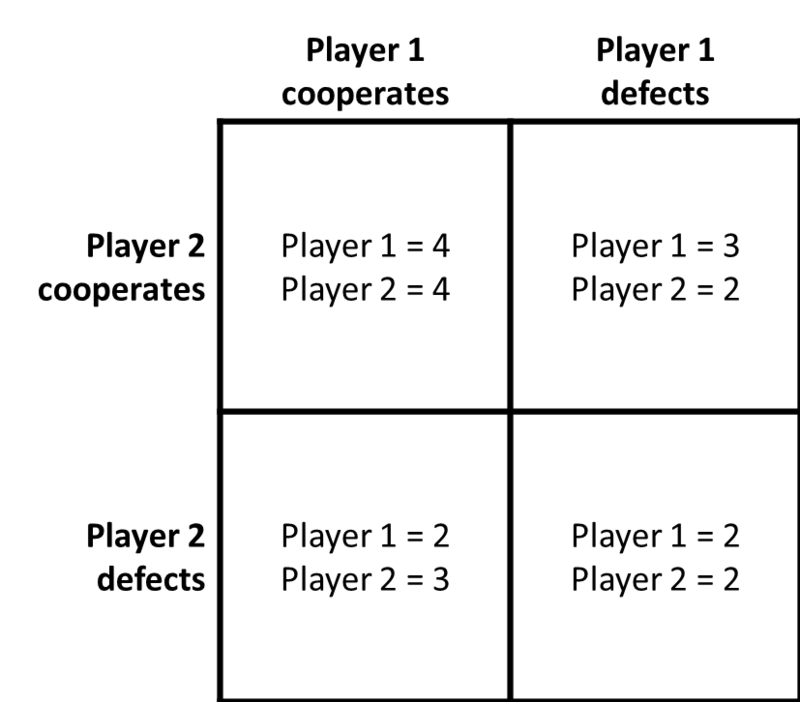 In the first case, where Player 2 has chosen to cooperate (p2choice = 1), then each player adds the cooperate-cooperate payoff to their respective cooperate-history lists. In the second case (following the open bracket [ indicating the alternative condition of the second ifelse statement), where Player 2 has chosen to defect, Player 1 adds the lone-cooperator payoff to their cooperate-history list, while Player 2 adds the lone-defector payoff to their cooperate-history. Next, we’ll look at the alternative condition of that first ifelse statement, in which Player 1 chooses to defect. Under this scenario, Player 1 has chosen to defect (p1choice = 0). Again, we’ll use ifelse to establish if Player 2 has chosen to cooperate or to defect. 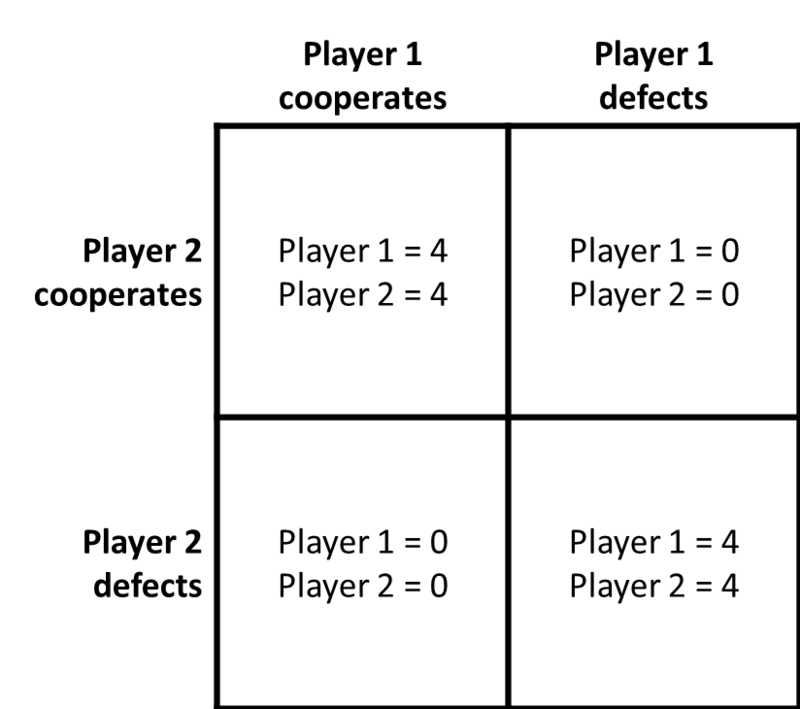 In the first case, where Player 2 has chosen to cooperate (p2choice = 1), then Player 1 adds the lone-defector payoff to their defect-history while Player 2 adds the lone-cooperator payoff to their cooperate-history. In the second case, where Player 2 has also chosen to defect, both players add the defect-defect payoff to their respective defect-history lists. Now that all potential outcomes from the game have been covered, we’ll finish up the check-game routine by first maintaining the cooperate-history and defect-history lists and then updating the decisions variable. The first part of this code asks agents to check the length their respective cooperate-history and defect-history lists. We’ll cap these lists at 10 interactions by asking agents whose lists are longer than 10 to drop the oldest item from those lists. We can do this using the remove-item command. Because we were updating the lists with lput, which adds items to the end of a list, the oldest item in each list is item 0, so that will be the item which gets dropped. Finally, the global decisions list is updated with the choices from both players. Set the Y min value to 0 and Y max value to 1, as both of our measures will fall somewhere between 0 and 1 (make sure the Auto scale? box is ticked). 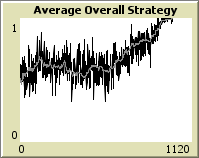 The examples below will plot mean decisions in black and percent cooperating in grey. You can change the colors of the pen to suit your needs. 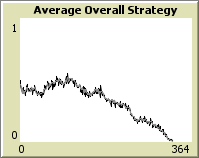 In one instance, the overall strategy trends toward 1 (cooperation), while in the other the overall strategy moves toward 0 (defection). Why does this happen? At the outset, each agent has a cooperate-history and defect-history seeded with 0’s and 4’s; the relative proportion of these for each agent will determine whether they will cooperate or defect on their next turn. At first, these will fluctuate around even, but over time, these random fluctuations reach a point where the proportions of cooperators versus defectors drives the system toward fixation at one end of the spectrum or the other. 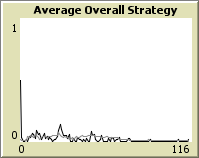 The increased variability in the mean decisions is due to the fact that, because some agents may not have any other agents within the search-radius during a given time step, there will be fewer games being played overall, and the outcomes from those that are played can swing the mean decisions to a greater degree. However, this also affects the time it takes to reach fixation, as the homogenizing effects of the process don’t spread as quickly when the number of potential opponents for any given agent is small. The plot on the left uses a search-radius of 5, while the plot on the right uses a search-radius of 1. As you can see, both move toward defection fairly rapidly; however, the time until defection becomes the sole strategy can change based on the search-radius, with smaller radii taking longer to reach fixation. In both scenarios, agents begin for the most part in a cooperative mood, which makes sense since this is the optimal strategy. Over time, however, they move toward the center, eventually settling into an uneasy equilibrium around 0.5, never reaching fixation.  As earlier, the search-radius of 5 (left) is less variable in terms of its mean decision value than that with a search-radius of 1 (right). But the search-radius of 5 takes longer to reach the center equilibrium state than does the search-radius of 1. Why might this be? We might get some insight by further increasing our search-radius to 10. Remember how the memories of all of our agents are seeded with random values from the relevant strategies? This means that some agents will start out more cooperative and some will start out more prone to defection. Under the decision-matrix used for this game, very few agents will be prone toward defection (in the last case, just one), but those that are will persist in defecting because nearly everyone they encounter will be cooperating with them. They are free to be jerks with absolute impunity. In this scenario, if these defectors are interacting with a large number of potential players (search-radius = 10), then the ill-effects of their bad behavior get spread around, having little effect on others. This allows a few defectors to persist within a general climate of cooperation. But if the search-radius is smaller, then there is a good chance that a defecting agent will interact with the same opponent multiple times in succession. This has the effect of wearing down the cooperating agents, eventually encouraging them to defect. As more and more are brought over to the dark side of defecting, the population eventually reaches a threshold at which the number of cooperating and defecting agents balances out, producing shifts around a mean decision of 0.5. Under such conditions, even though the optimal strategy is cooperation and agents generally start out cooperative, a few bad apples can spoil the party. The way this model is built allows us to explore a multitude of non-cooperative games and the effects of interaction distances on them. But this is not the only way to build game theory ideas into an agent-based model. 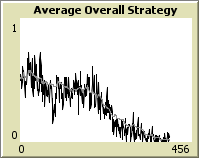 The NetLogo Models Library has several examples of Prisoner’s Dilemma, spatial and non-spatial, which can be used to assess different ways the game might play out. This tutorial is meant to be a thought provoker on how game theory ideas might be incorporated into an agent-based model, rather than a thorough treatment of spatially-explicit games. Spatially-explicit and iterated games have been explored using simulation in much greater detail elsewhere. A good place to start is Robert Axelrod’s book The Evolution of Cooperation, as well as the work of Nowak and May. There are several articles in the Journal of Artificial Societies and Social Simulation dealing with this subject. Finally, while this tutorial has focused on non-cooperative games, there are other kinds of games which can be explored. Cooperative games are aimed at the strategic formation of coalitions. 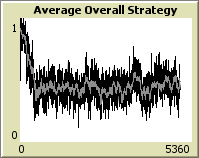 Some games involve stochastic mechanisms for deciding strategies: mixed strategy games, for example, involve a probabilistic determination of strategies rather than a strict choice of the most optimal strategies. Code for the model can be found here.